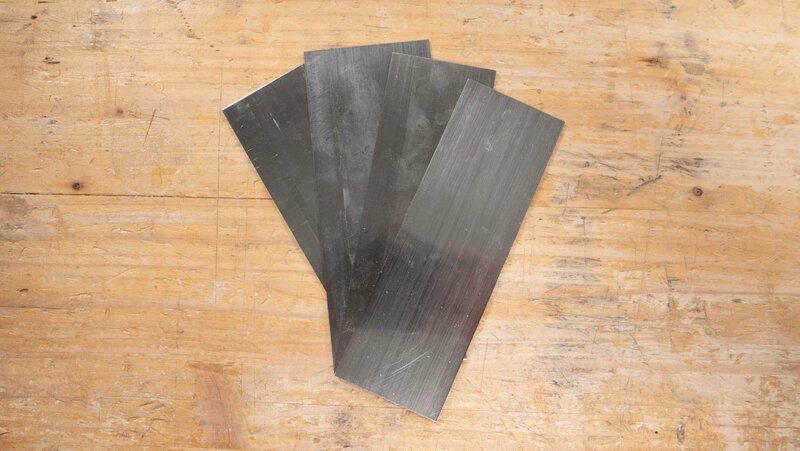 The card scraper is a plate of sheet steel which is sharpened along the full length of the long edges and relies on careful precision throughout the sharpening process. The card scraper performs much the same tasks as the #80 scraper (cabinet scraper) and both blade types are made from plate steel, however their blades are sharpened differently. The card scraper has a burr on each corner of both the long edges. This burr creates the shavings which curl upwards from beneath the hook of the cutting edge. The slicing cuts reduce the tearout often associated with hand planing. Using the card scraper results in a finish surface that often eliminates the need for heavy sandpaper use, it creates a smooth surface on awkward grain in a way that you cannot achieve with any other tool. The card scraper also allows you to focus on one small area, taking off very small amounts of material without having to remove material from the surrounding areas to even it out. This is especially useful when removing minor defects or surface marks. The card scraper can be reshaped to suit a hollow or spoon bowl, this doesn’t take long is perfect for shaping. This is known as a ‘curved’ or ‘round’ scraper, to see how to make a rounded card scraper, click here. The two-thumb method is often used on narrower boards as your knuckles have room either side of the board but on larger pieces the heel-of-the-hand method may well work better. The scraper is used to create a smooth finish on a wood surface. Due to the flexibility of the card scraper, it can be used on curves and edges whereas the #80 scraper cannot be used in the same way due to the blade holder. It would be nice if you could provide a list of the current average price of tools (new and old) say from e-bay. I know there are plenty of assumptions that would need to be made but… it would give the readers an idea. The prices of the tools we have purchased new are checked on a regular basis to ensure they’re up to date. As the price of tools on eBay can change daily, the prices of tools we purchased second hand are from at the time of purchase. A piece of broken glass would do the same job and does not need to be resharpened!!! you just throw it away and get a new one!!! jajaja!! Thank you Paul and Team for making all this knowledge available to us! !